I made this card for Mother's Day card for OWH. I printed the image twice and cut out tulips from the second printout to give dimension with pop dots. 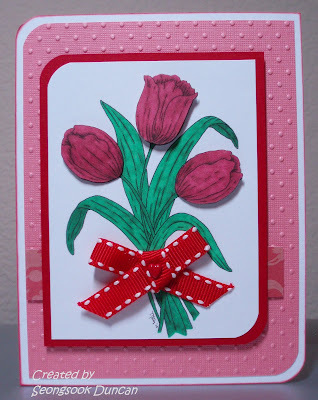 This beautiful digital image "Tulip Trio" on my card is created and donated by Tracey-Lynn Miller, owner of Fred, She Said Digital Designs for OWH card makers. How nice of her! I used Stamping 411 Sketch #141 although I missed due date for the sketch challenge. I thought that both of image and sketch would work well together. OMGosh this is so pretty! Oh I love how the tulips look popped out! Such a pretty card you !